This was one of two extraordinary lunches I enjoyed at Marea recently. It had been a few months since my last visit, and I had forgotten just how extraordinary the food and service can be. Lunch started with the trio of crudi, which can also be ordered separately. The passera (fluke) and dentice (snapper) and tonno (tuna) were all impeccable. The fish was simply crystalline and pure. We also had the Nova Scotia lobster, which is one of the signature dishes at Marea. The combination of lobster, burrata and eggplant is unusual, but it just works, as do most of Michael White’s creations. The same can be said of the fusilli with braised octopus and bone marrow, which is one of the most compelling dishes in New York City today. I never tire of it. The idea of octopus braised in red wine and bone marrow is, like all beautiful things, simple and maybe even a touch obvious in retrospect, yet totally unique. 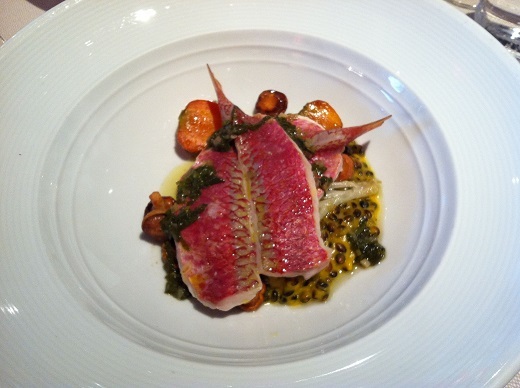 Rouget is one of my favorite fish because of its intense flavor and elegant texture. Marea served the fish completely deboned, removing any and all obstacle to savoring this fabulous dish. The rouget was delicious, but the accompanying black farro was equally flavorful. It would have made a stunning dish on its own. Tiefenbrunner’s 2010 Müller Thurgau Feldmarschall came across as surprisingly big and almost dramatic, but with fabulous balance. Hints of lime, white flowers and crushed rocks flowed effortlessly from this striking, chiseled white. I adore Alto Adige whites with Marea’s cuisine. The Feldmarschall was firing on all cylinders. I was completely blown away by Beniamino Zidarich’s 2008 Malvasia, which was suggested by Francesco Grosso, Marea’s Wine Director. I had just been to the cellar a few weeks earlier. Still, I was not fully prepared for the exquisite beauty of this wine. The Malvasia, which sees a short period of contact on the skins, was fabulous. It blossomed in the glass with layer after layer of varietal flavor, revealing tons of depth and exceptional pedigree. It was superb on its own, but really blossomed with the food. This was a great showing from one of Italy’s top artisan growers. We skipped dessert. The cookies and chocolate served with the espresso were more than enough after this big, rich lunch. Marea remains one of the very top spots in New York City for great food and wine, especially in mid-town, a neighborhood with more than a few pretenders. Though not inexpensive, Marea delivers the goods…and then some, time after time.